Notification channels and badges are part of the many updates in Android O. 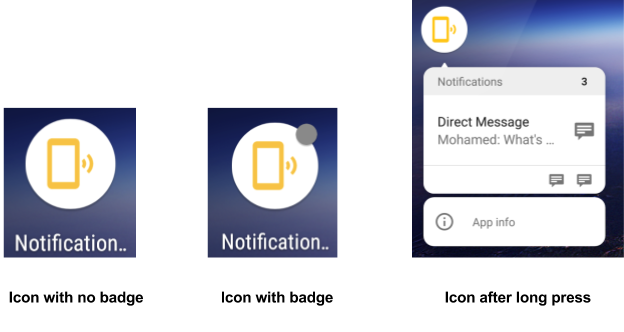 Starting in Android O, you divide all of your notifications into different notification channels, depending on the type of notification your app is sending. Using channels, you can easily differentiate between different types of communication and provide different default sounds, importance, icons, and more. 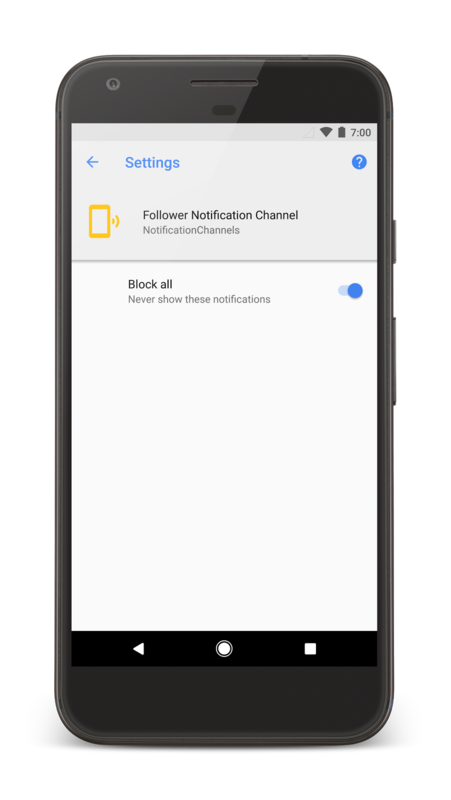 Once a notification channel exists on the device, users have full control over the settings per notification channel. 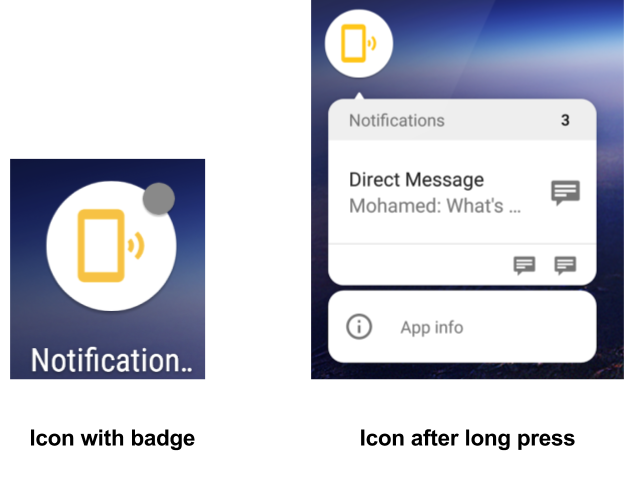 You may see notification channels referred to as notification categories, and notification badges referred to as notification dots. This codelab uses the terms notification channels and badges to match the wording used in the API. Why learn about Notification Channels? More control over their notifications. They can opt into types notifications for your app instead of being forced into an all or nothing decision. Standardized UI. 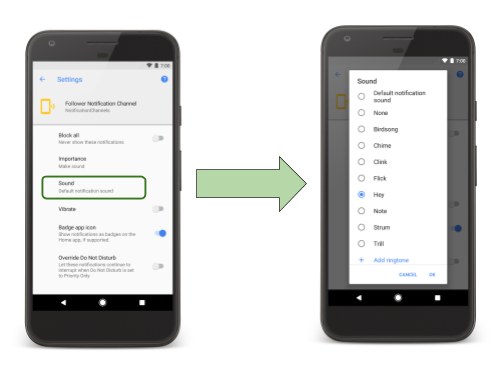 The notification settings UI for Android O is based on notification channels and is a standardized experience for users. Explicit and predictable. Users can easily see the all different settings they have for their notification channels. 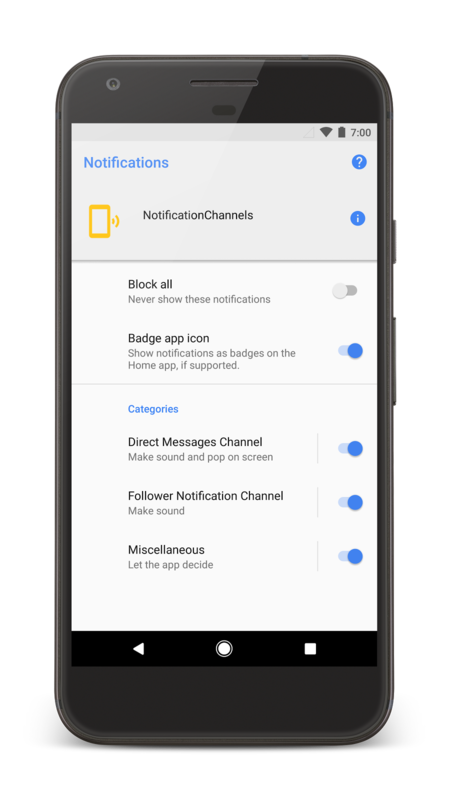 Any time they change a setting for a channel, it applies to every notification in the channel and cannot be overridden by the app. This means the user's choices will always be respected and there will never be discrepancy between what settings the user picks and how the app's notifications behave. Allow you to explore the user experience and flow of O notifications. Create two different notification types which are therefore part of two different channels. A basic understanding of notifications before Android O. 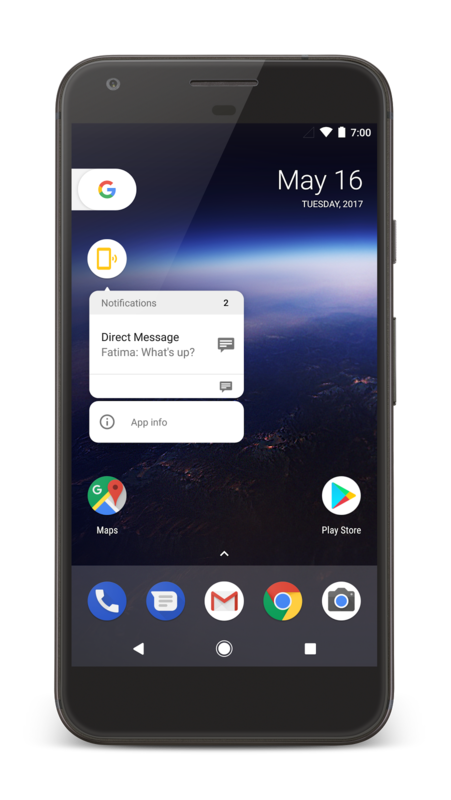 A device running Android O with a launcher that supports badging. Running finished version of this code lab code, downloadable here. If when you create notifications, you see badges, your device supports badging. If you do not have a device that supports badging, you create a Pixel emulator running O. Note, before making the emulator you will need to download the O system image and O SDK using the SDK Manager. In this step, you download the code for the entire codelab and then run the simple example app. Unzip the code, and then open the project using Android Studio version 2.4 or newer. Run the code and confirm that it compiles. Note that the buttons currently should not do anything. You'll be adding that functionality! Receiving a direct message from a friend. Receiving a direct message from a coworker. You need to change the code so that it works with O's NotificationChannels. Until then, the notifications will not work. Let's see how to add notification channels. You start by creating a notification channel. 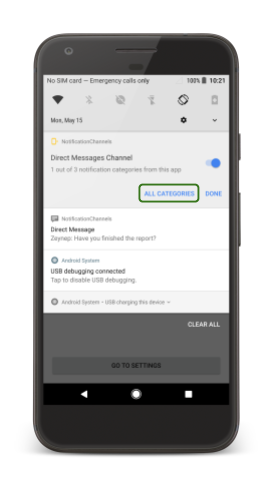 A notification channel represents a type of notification your app posts, so that users can pick settings specifically for that type of notification. 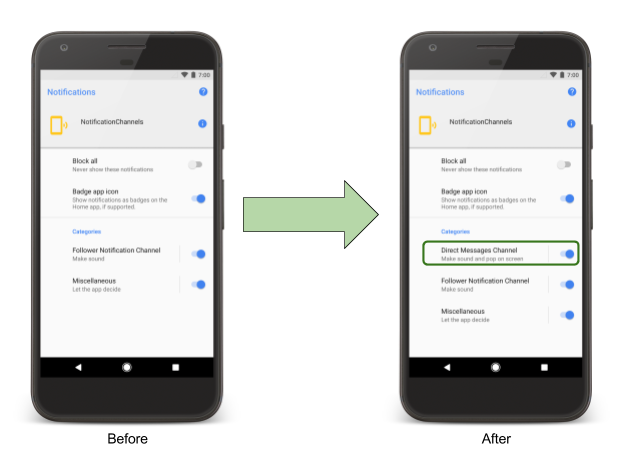 When creating channels, you typically first identify each distinct type of notification your app sends. 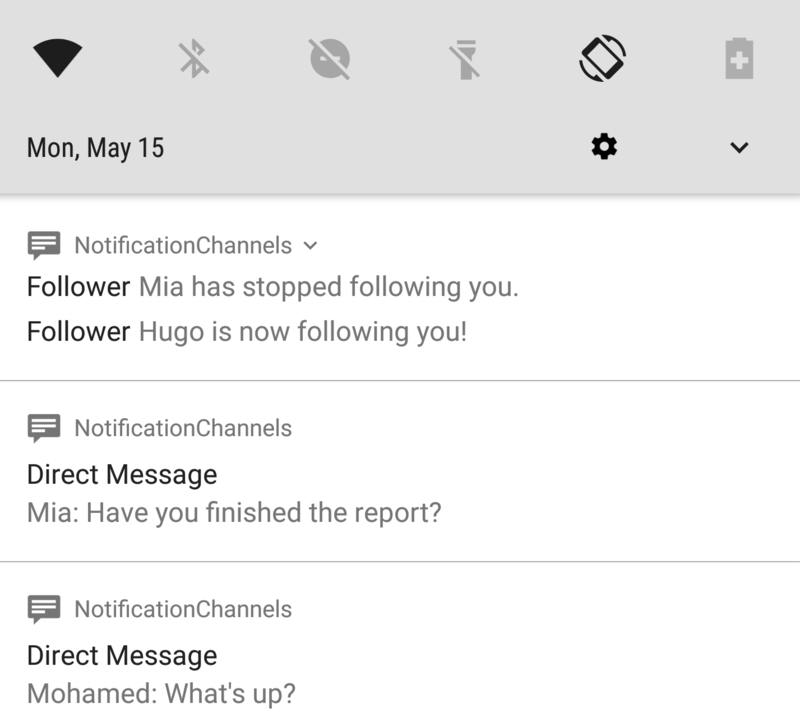 In the sample app, there are two types of notifications: notifications about who's following you and direct message notifications. Therefore you make two notification channels. Although you don't do this for this app, you can also create notification channels as users make choices in your app. For example, you might set-up separate notification channels for each conversation group created by a user in a messaging app. // Create the channel object with the unique ID FOLLOWERS_CHANNEL. Creates the channel object with the unique ID FOLLOWERS_CHANNEL, the name "Follower Notification Channel", and default importance. Configures the channel's initial settings. Submits the channel to the NotificationManager. If you try to create a channel whose original values already exist, no operation is performed. This means you can safely do this each time you start the app. It also means that if you call createNotificationChannel(followersChannel) and then try to change followersChannel's configuration afterwards, those changes will be ignored. Always configure your channels settings and then call createNotificationChannel. There are two cases where you can update the channel's attributes and recreate the channel - you can rename the channel or change the description. You can do this using createNotificationChannel. Set the importance to high. Set the light color to blue. You can view the location of the code you'll update by looking at these TODO comments. You can view the solution diff here. You may have noticed that the notification simulating app doesn't actually send notifications. This is because the code is using the now deprecated notification builder Notification.Builder(getApplicationContext()). For Android O and beyond, all notifications need a notification channel. Notice the usage of the FOLLOWERS_CHANNEL id, which is the same id that was used when making the follower channel. These must match. Once you're finished, clicking on any of the buttons to send notifications should now send a notification. View the solution diff here if you get stuck. 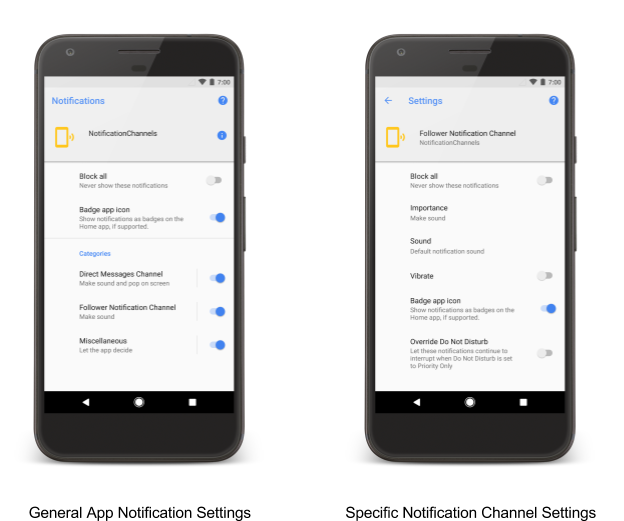 A valid notification channel ID, set by setChannelId() or passed as an argument to Notification.Builder. Now that you've created these channels, you might be wondering what the actual user experience is. Navigate to notification settings on the device running the app. You can do this two ways: press the Go to Settings button in the app, or if you long press on a notification, you can select the ALL CATEGORIES option to be taken to the app's notification settings screen. If you trigger a follower notification, you should notice the new sound playing. The direct message notification sound has not changed. Now let's say your social media profile is hugely popular and you get tons of followers. Perhaps you don't want to be notified every time a new person follows or un-follows you? In that case, you can turn the entire channel off. If you re-run your app from Android Studio, you may notice that the settings you picked are NOT changed. As you can see, all user selected settings override the defaults you choose as a developer. This allows users to choose how they want to receive your notifications. This code creates an intent with the action Settings.ACTION_APP_NOTIFICATION_SETTINGS; this opens up the notification settings screen for a single app. The package name is included as an intent extra to specify which app the settings screen is for. Add the code to go to a specific channel settings screen. You should modify the goToNotificationChannelSettings method. It will look similar to the intent for opening an app's notification settings. You need to modify the action of the intent and also include the channel id as an extra. Take a look at the Settings documentation for the appropriate action and channel id extra. Note that the channel id should be passed into goToNotificationChannelSettings. The method is called from onClick in the MainActivity. You should pass either FOLLOWERS_CHANNEL if you press the Follower Notification Settings button, or DIRECT_MESSAGE_CHANNEL if you press the DM Notification Settings button. 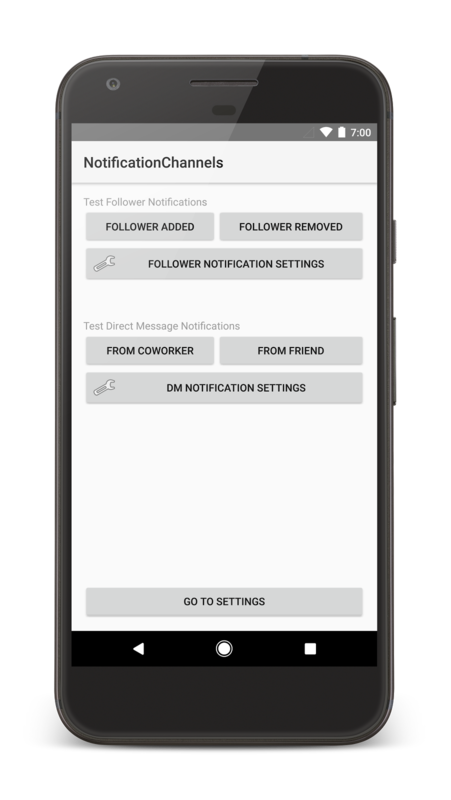 When you're finished, if you select the DM Notification Settings, it should take you to the settings screen specifically for direct message notifications. You can look at the solution diff here if you get stuck. You can also read the settings your user has selected? To get access to the current settings of a notification channel, you can use NotificationManager.getNotificationChannel(). Your device's launcher supports badging. You or your user haven't turned badging off for the channel. 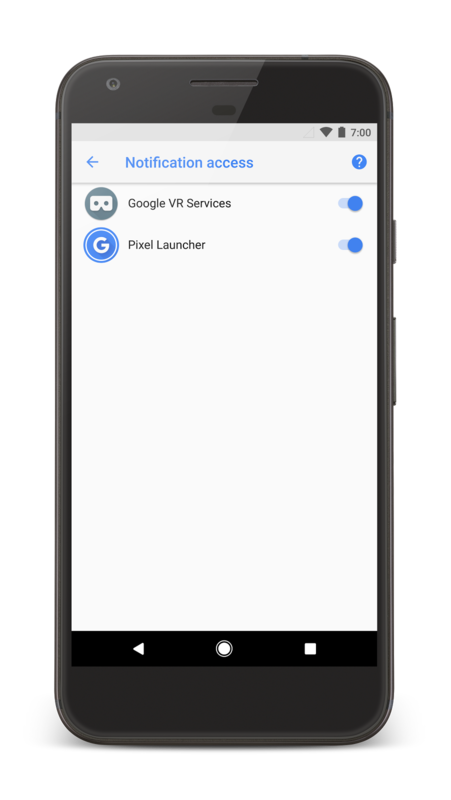 If they do not, make sure your launcher has notification access as described above. If you get stuck, check out the solution diff here.